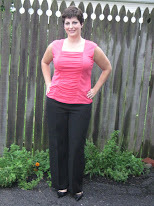 Pudget: Losing Weight On a Budget! : Bootcamp Bonanza Day 2 Giveaway!!! excited to share it with you! I was given this product from Powerhouse Performance Coaching. 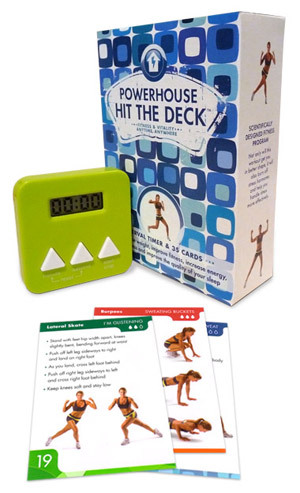 It is called Powerhouse Hit The Deck and it is one of the most useful exercise products that I have seen on the market. Powerhouse Hit The Deck is a portable and easy to use fitness program that can be done anywhere with no equipment. Everything you need is in this little box that is smaller then my wallet. Seriously, it's pretty cool! I was so excited when I opened the box to find so many of the exercises that I do at Bootcamp all on little cards. This set has warm up/cool down cards, "No Sweat" cards, "I'm Glistening" cards and "Sweating Buckets" cards. This way you can choose your level. These cards not only give pictures of the exercise but they also give step by step directions. It makes exercising so much easier when you have good instructions. The set also includes a timer so that you know exactly how long you need to do each exercise. Such a cool idea! The way you use the Powerhouse Hit The Deck Cards is to set the timer, draw your first card and preform as many repetitions of the exercise on the card as possible. When the timer runs out you draw a new card. This way you can design your own workout. The back of the box says "Each card provides both cardiovascular and resistance training at the same time, making your workout more efficient and effective.". It is such an easy to use program. I think whoever developed this program really had a great idea. So many exercise magazines and books have exercise programs that are so overwhelming and confusing. Powerhouse Hit The Deck is so much different because it makes it so simple to have a great workout anywhere, anytime. I'm loving this idea! Click here to check out Powerhouse Hit The Deck. Powerhouse Performance Coaching was generous enough to give one reader as set of Powerhouse Hit The Deck cards (with timer). 1. Leave a comment sharing with us your favorite form of exercise. 2. 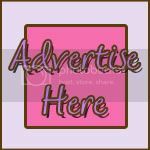 For a second entry become a follower of Powerhouse Blog and then leave me a comment telling me you did so. 3. For a third entry post on your Blog, Facebook Page or Twitter about this contest and include a link to my blog and post the link in the comment section. Can do all three if you would like for extra entries. The Winner will be chosen using a random number generator. All entries must be received by Thursday, Sept. 9 , 2010 at 11:59 CST. The winner will be announced Friday, Sept. 10, 2010. For U.S Addresses Only. All About You Design is responsible for mailing prize. This review is my honest opinion of Powerhouse Hit The Deck. I was not told or paid to say anything in this post. I am not responsible for any prizes. My favorite form of exercise...hmm I am not sure I have a favorite - but right now I enjoy walking. Cool giveaway! I also follow your blog on reader! my favorite form of exercising is swimming. I could do that everyday! My favorite form of exercise is walking or swimming, right now anyway! I posted your link on my Facebook page! My favorite form of exercise is cycling/spinning. My favorite form of excercise is probably walking while I play golf. It also helps if I have someone else with me. I favorite exercises are Zumba and spinning. The time seems to fly by in these classes. My favorite form of exercise is dancing! I don't LOVE exercise before I do it only after. My favorite is walking, long, long walks around Town Lake in Austin are the BEST! I am a facebook follower!!! I subscribe to your blog through google reader! I just subscribed to the Powerhouse Blog in my google reader! this looks amazing! The best solutions are usually the simplest ones! My current exercise is walking, and I love it, but would love a way to work some variety into it. Thanks for the opportunity! I love walking, especially in the spring and fall months. This sounds like such a great idea! I love to ride my bike. My favorite exercise is walking! My favorite form of exercise is Zumba! I also follow the RSS feed of your blog. My favorite type of exercise right now is my couch to 5k training. I have never really run before, so it is helping me bust a horrible plateau I have been on! I'm trying to find a favorite form of exercising...the extra 50lbs demand it. I also subscribe to your blog, which I read daily. We have so much in common. I started out at 218 and I'm at 168 right now. Isn't a wonderful feeling to know that our God is a good God!! If I had a favorite form of exercising would I be desperate for this one? :) If I HAD to choose, I suppose ab workouts would be my favorite because it doesn't take long to feel that they are working! I am also your friend on FB.